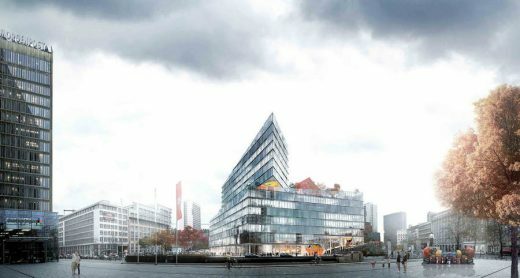 This building forms the headquarters of the power supply company 50Hertz in the Mitte district of Berlin, in the new Europacity quarter of the city. After around five years of planning and construction the so-called “Network District” was opened in early September 2016. The jounrey started with an architectural competition, won by the “Love architecture and urbanism” studio from Graz, Austria. Some 650 employees will occupy the thirteen story building that was constructed ecologically. 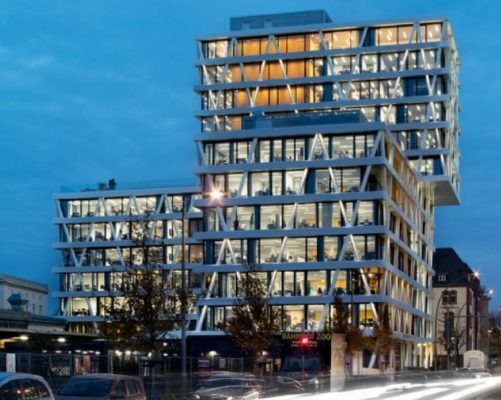 The slender, transparent architecture supports social exchange and provides a vital impetus for the working atmosphere, for instance by means of the many open green spaces. These occur at different heights through the principle of façade elements that are transposed against each other. The exterior image is characterized by a geometric structure consisting of slanting, steel-covered concrete pillars. 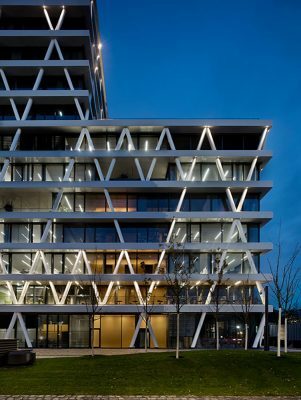 At night, products from ewo lend the supporting structure a communicative effect. Through the accentuation of the pillar structure, light connections are created in the darkness that allude to the interplay of the triangular voltage diagram of an alternating current curve. The more than two hundred tightly focused architectural lights that are used for this are customized editions. 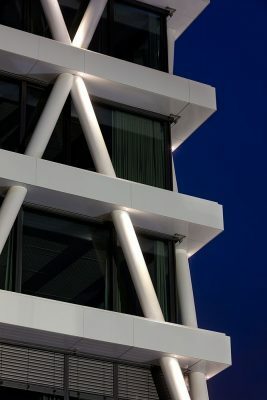 They are based upon our R60 spotlights, but they meet additional challenges that emerged from the construction design. Thus the only possible positioning was in the lower side of the covering of the horizontal supports into which the light sources were to be fully and flushly integrated. The product can be removed from below, which allows simple mainte­nance. In order to guaran­tee efficient assembly, we developed eight differ­ent housings with correspond­ing assembly cases on the basis of detailed and precise lighting technol­ogy design. 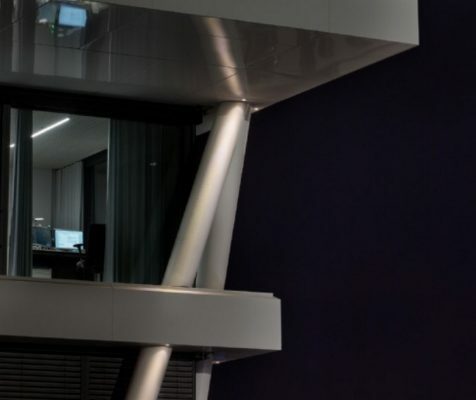 They allow the inclina­tion of the light source in the direction of the correspond­ing column, ensuring that the light strikes everywhere parallel to the column because only in that way will the envisaged effect be created. 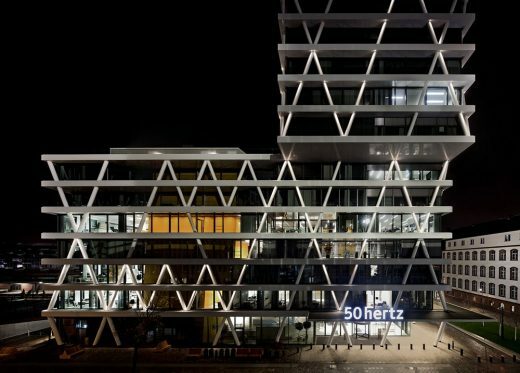 After the lengthy planning and construc­tion process, success has been achieved: an intuitively understand­able signal is present, a succinct accent from 50Hertz for nighttime Berlin. 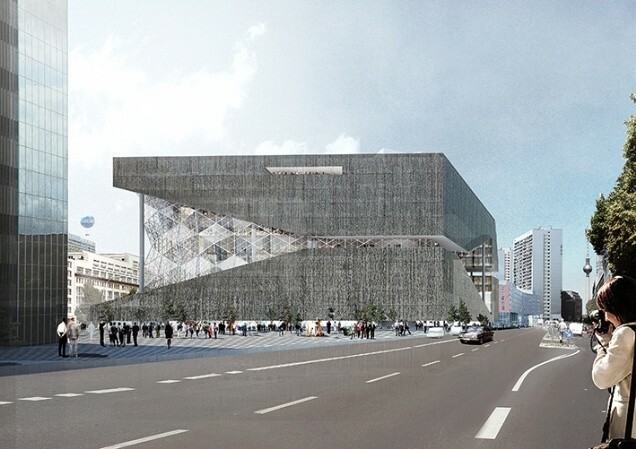 Another of the three shortlisted entries for the new Media Campus for AXEL SPRINGER in Berlin, Germany.